Here we go, again. Another September 30th. Ever since I became a parent, approaching 19 years, now (that’s 133 in dog years), I’ve become acutely aware of this date. The eve of what I like to refer as The Slide. That is, the cosmic phenomenon of the beginning of the end for whatever year you or I happen to be living through. You know, the one where the space-time continuum accelerates to the point that the year is suddenly over. All of those things that happen between now and the end of the Rose Parade just a blur. A fleeting memory. A brief synopsis of the film: Bizarre events are rippling through the kingdom of Enlad. The King, already hearing tales of drought and pestilence in the land, as well as the news of people going insane, receives word of a strange omen. Dragons appearing and fighting out at sea. Along with the disappearance of his son, Prince Arren, it’s troubling. Shortly, the ruler is struck down in a dark corridor of the castle, and his sword taken, by his teen son. Thus, the wandering wizard Archmage Sparrowhawk begins investigating the cause. During his journey, he meets the distraught Prince Arren. While he may look like a shy adolescent, Arren has a severe dark side, which grants him strength, hatred, and ruthlessness. The wizard’s counterpart, Lord Cob, sees an opportunity to finally vanquish his enemy the Archmage by using the boy’s “fears” against the very one who would help him. This will not only be the most recent film in our series for the year, but also a title I’ve not heard of nor seen before. I was pleasantly surprised to learn this was another effort from the famed Japanese animation company of Studio Ghibli, Inc. Spent many an hour watching their anime shorts and film over the years, which my kids have taken further than I. The same studio that shocked its fans on August 3, 2014 by announcing it was temporarily halting production following the retirement of director Hayao Miyazaki. Fitting, it seems. 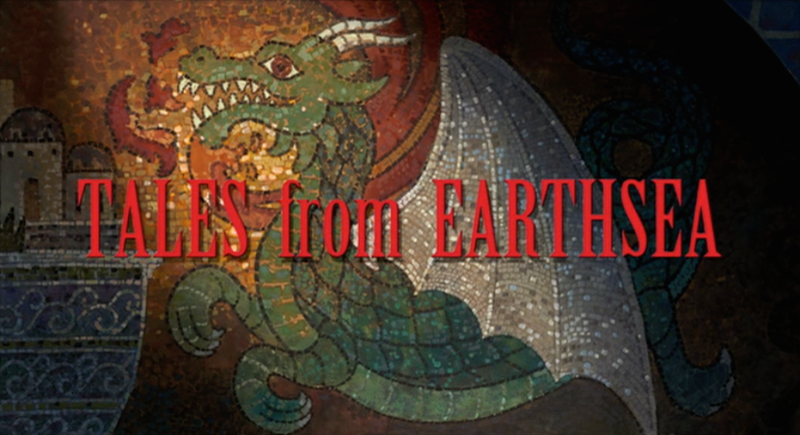 Tales from Earthsea as a film was an interesting amalgam of ideas, styles of animation, and thought-provoking fantasy. No one can argue either Ursula K. Le Guin nor Haya Miyazaki don’t know how to entertain and enthrall their readers and viewers. There’s certainly many aspects to contemplate with this international effort. Although, it might lead to some head-scratching from that same set of groups as a result. They won’t be bored, though. Just a little confused, like this moviegoer. My wife and kids joined in with me and used this as our Saturday night family movie event. We were amazed as we watched and enjoyed the stunning animation Studio Ghibli is known for with our introduction to the Earthsea kingdom in this sitting. The amount of blood — spilt and an appendage sliced off — was unforeseen. Of course, now that my kids have seen enough anime swordplay in their young viewing lives, they expect it going in. A bit surprising for my wife (more of her reaction later), though. But, at least she didn’t leave the room. Tales from Earthsea a joint venture with Disney, and the first to be awarded a PG-13 rating care of the overly protective folks at the MPAA. Still, the animation and score, done majestically by Tamiya Terashima, were the primary draws of the evening. Haya’s work speaks for itself. Even if it was his son, Gorō Miyazaki, who took on the effort in his first directorial stint after his father convinced Ms. Le Guin to allow him to adapt a story from the mid-series collection. I learned afterwards she (and likely some of her fans) was not thrilled with the result. Even Hayao was dissatisfied with the decision, thinking Gorō lacked the necessary experience. Still, after watching this film I enjoyed the overall feel and look of the fantasy production, though it left me a bit mystified. 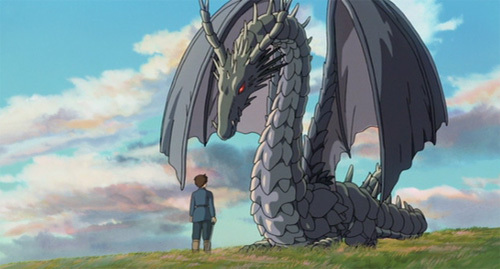 Perhaps, not having read any of Le Guin’s Earthsea stories put me at odds in understanding what was going on in this fantasy world, no matter how dazzled with the animation-candy I’m hooked on. More digging provided news the senior Miyazaki incorporated some of his own graphic novel, The Journey of Shauna, into the adaptation. Which might be at the heart of the foreign criticism this release received1. It’s a difficult edge one has to balance in crossing realms, real or imagined, I’d reckon. Cultures, too. Japanese filmmakers fashioning an American’s fantasy tale for their audience. Let alone rendering it to the author’s readers, with subtitles and/or the inevitable English dubbing, in an attempt to sell it all back to American movie-viewers. We could only get our hands on the dubbed version for this review’s screening. Funny what and who you pick up when watching such a thing. I immediately recognized Bond #4, Timothy Dalton, as the voice of Gandalf, err…Sparrowhawk. My son identified Mariska Hargitay as Tenar, a woman who is Sparrowhawk’s girl old friend. I figured his being hooked on Law and Order Special Victims Unit by his mother (of all people) the reason. Although, my wife got the most attention of the evening when she quipped, “I didn’t know Michael Jackson was in this.”, on first laying eyes on Lord Cob. Voiced by Willem Dafoe in a very controlled performance I wished he’d given to his The Langoliers audiobook narration a few years back. But hey, that’s just me. Ironically, it that 2004 film that prevented Haya Miyazaki from directing this production. 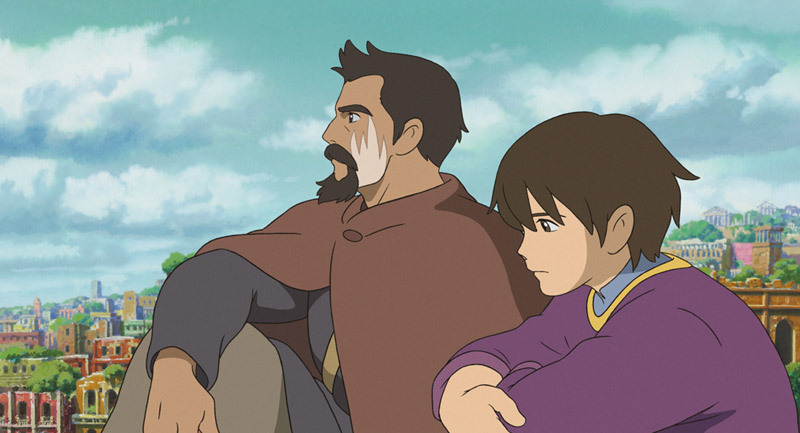 My initial criticisms aside, Tales from Earthsea is still a visual masterwork. Especially whenever a dragon comes onto the screen. Thoroughly enjoyable to behold from that aspect, which made me wish for more. As others have mentioned, the film does not compare as favorably to something say like Howl’s Moving Castle, including its dubbed version. Another story drastically altered from its own source material, but a translation (which I took my children to some years ago) that still managed to stand on its own as a story. Nice post. I haven’t given this a close read as I haven’t yet managed to see this one. It’s been on my watch list for along time though. I love Miyazaki’s visual style and these images look beautiful. Fine review. I know I’m missing out on a number of highly praised movies but the anime art style is such a barrier for me. I’ve never liked it in movies, comics, or anything. That hurdle is probably hindering me from seeing some really good films but it’s there nonetheless. It’s a distinct style and that can be a determining factor. I credit growing up during the 60s when some dubbed Japanese cartoons (Gigantor, 8 Man, etc.) played on local TV as something that prepped me for this. If I hadn’t watched, it may have been different. I can only encourage you to give some of these a go. Maybe Princess Mononoke or Spirited Away? Thanks, Keith. Always appreciate your thoughts and comments, my friend. I haven’t seen this, but I do hope Gorō Miyazaki gets better with experience. I bow to no one in my admiration for Hayao Miyazaki and Studio Ghibli, but the trailers made this look a little too generic. 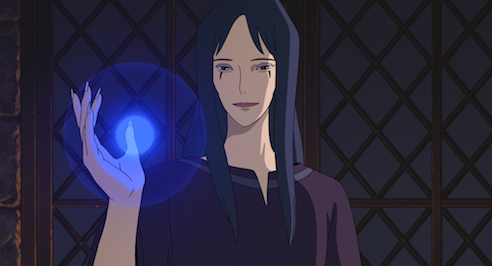 I haven’t kept up with the Earthsea books that followed the initial trilogy, but I see Ghibli committed the same offense as the Syfy channel by making the characters lily-white instead of the red- and brown-skinned faces described by Le Guin. Other authors have been unhappy with Miyazaki’s use of their material. Eiko Kadono almost tried to block production of “Kiki’s Delivery Service” because of the changes to the novel and character. The movie is, of course, one of the most charming films ever made. I haven’t heard of this one before, but I have such viewing holes in terms of Studio Ghibli. This one sounds intriguing though, fine review as always Michael! I would not call this a successful adaptation. This was really more an “inspired by” sort of thing. I leave both the movie and the books indifferently. I wouldn’t recommend them but so many people love them that it’s obviously all about personal taste… as usual. Regardless, I’m glad we gave these a shot. It was fun to have good motivation to try earthsea again and we’ve never had an anime title so that was cool, too. Thanks! Forgot to mention that the fun thing about getting this movie is that it was right next to Tales from Vespiria which I didn’t even know was a movie. 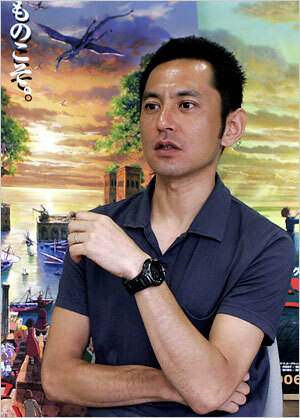 (It’s a video game that is part of a great “Tales” series.) I couldn’t leave without it so Jeff and I watched it yesterday. That’s more anime in a week than I’ve seen in years. 🙂 The Vespiria story made more sense but the execution in Earthsea was much better. Vespiria had much melodrama and hysteria. Its a feature of anime that has always been difficult for me to digest: the stories are very mature but the characterization can often be so infantile. Kind of drives me nuts.